For the past month or so, I've been sticking mostly with "easy" posts, with not too much politics. I'm not trying to avoid politics, it's just that such posts need more time and care than I've been able to give lately. I've been really busy getting the farm ready for Winter. We've got a lot of projects to finish before the really cold weather and heavy rain kicks in full-force. His commentary on this is spot-on, and well worth your time to read. 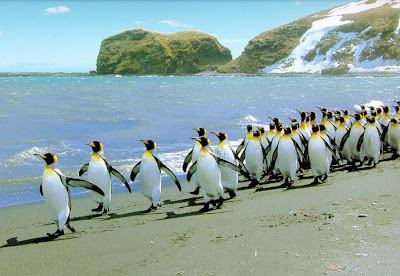 Penguin Power; coming with your next low cost laptop? Market trends have been moving towards people replacing their desktop computers with laptop computers, especially as prices of laptops continue to get cheaper, and wireless access becomes increasingly common. Opinion: As laptops get cheaper, Linux and Windows XP are both making better business sense than Vista. The good news for everyone is that you can get a good, solid laptop for under a grand these days. The bad news for Vista users is that many of those laptops, even though they're sold with Vista, have nothing like enough resources to run Vista decently. This year, from everything I've seen, has lived up to the Merrill Lynch prediction that 2007 would be the year that notebooks overtook desktops to become the bigger revenue generator for PC makers. For some companies, like Hewlett-Packard, laptops have become the single most important revenue source. There are a couple of reasons for this and they're closely tied together. First, a PC vendor can make more profit on an under-$1,000 laptop than it would on a PC at the same price. At the same time, with Wi-Fi being available essentially everywhere and laptop prices falling below the magic $1,000 mark, more and more customers, both consumer and business, are turning to laptops. There's only one little problem with this if your company name is Microsoft. Those under-$1,000 laptops can't run Vista worth a darn. In addition, Vista has become a bigger and bigger part of a laptop's cost. So, if you're a PC vendor, you could either upgrade your hardware—and there goes your sweet price point; put Vista Home Basic on the system—which even Vista lovers admit is trash; or continue to sell Windows XP and give adventurous customers a Linux option. What's happened is that people aren't upgrading their basic laptops. Computer price margins are razor-thin. If people want top-of-the-line laptop, vendors are happy to provide them at an appropriate price point. But Dell, HP, Acer, et al. know darn well that they sell more of their cheaper systems than premium ones. See the rest of the article for more particulars, and embedded links. There are big changes occurring in the desktop computer market, and a whole slew of low cost laptops and micro computers that will be coming onto the market soon, and Windows Vista is not capable of running on many of them. Linux is, and as a result, we may see it coming into use more widely. Lets hope so. [...] If you pay close attention, you'll find that Global Warming alarmists are not actually saying "Global Warming" lately. No, nowadays it's "Climate Change." Do you know why? Because for the past three years, global temperatures have been falling. Oh, you know the list. They're still making the same predictions — they just move the dates farther back. It's like those millennarian religious cults in the 1800s. Religious leaders would arise who would predict the Second Coming of Christ in 1838. When Christ didn't oblige them by showing up, they went back to their visions or scripture calculations or whatever they claimed and report that they miscalculated, now it was going to be 1843. Or whatever. Bold emphasis mine. Read the whole thing, there is so much more. Real science needs to be talked about, examined and discussed rationally, not religiously. [...] For more than a decade, Henrik Svensmark of the Danish National Space Center has been pursuing an explanation for why Earth cools and warms. His findings -- published in October in the Proceedings of the Royal Society -- the mathematical, physical sciences and engineering journal of the Royal Society of London -- are now in, and they don't point to us. The sun and the stars could explain most if not all of the warming this century, and he has laboratory results to demonstrate it. Dr. Svensmark's study had its origins in 1996, when he and a colleague presented findings at a scientific conference indicating that changes in the sun's magnetic field -- quite apart from greenhouse gases -- could be related to the recent rise in global temperatures. Svensmark and his colleague had arrived at their theory after examining data that showed a surprisingly strong correlation between cosmic rays --highspeed atomic particles originating in exploded stars in the Milky Way -- and low-altitude clouds. Earth's cloud cover increased when the intensity of cosmic rays grew and decreased when the intensity declined. Low-altitude clouds are significant because they especially shield the Earth from the sun to keep us cool. Low cloud cover can vary by 2% in five years, affecting the Earth's surface by as much as 1.2 watts per square metre during that same period. "That figure can be compared with about 1.4 watts per square metre estimated by the Intergovernmental Panel on Climate Change for the greenhouse effect of all the increase in carbon dioxide in the air since the Industrial Revolution," Dr. Svensmark explained. Read on to see how these men proceeded to go about proving this theory. And why the global warming alarmists don't want you to hear about it. [...] Over the course of the Earth's history, the main factor driving changes in its climate has been that the amount of energy from the Sun varies, either because of wobbles in the Earth's orbit or because the Sun's power output changes. Most noticeably, it changes with the 11-year solar cycle, first identified in the mid-1800s by astronomers who noticed periodic variations in the number of sunspots. If it varied enough, it could change the Earth's surface temperature markedly. So is it? Henrik Svensmark and his collaborators at the Danish National Space Center (DNSC) believe the missing link between small solar variations and large temperature changes on Earth are cosmic rays. "I think the Sun is the major driver of climate change," he says, "and the reason I'm saying that is that if you look at historical temperature data and then solar activity and cosmic ray activity, it actually fits very beautifully. "If CO2 is a very important climate driver then you would expect to see its effect on all timescales; and for example when you look at the last 500 million years, or the last 10,000 years, the correlation between changes in CO2 and climate are very poor." When hugely energetic galactic cosmic rays - actually particles - crash into the top of the atmosphere, they set in train a sequence of events which leads to the production of ions in the lower atmosphere. The theory is that this encourages the growth of tiny aerosol particles around which water vapour can condense, eventually aiding the formation of clouds. Read more to see what calm, rational, logical and provable science looks like. The cosmic ray theory is not new, and it has been studied continuously and expanced on since the 1950's. Many tenets of this theory are now provable through lab testing, and the historical data collected fits together to support it, in the complete and WHOLE picture. It's demonstratably correct, and makes more sense than incomplete data manipulated with software. gOS operating system; Linux for the masses? Review: Is gOS the future of desktop computing for the masses? 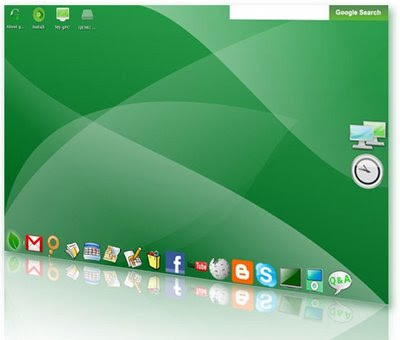 gOS 1.01, the unofficial Google OS launched last week, is Ubuntu 7.10 with an idealistic twist. This lightweight ready-to-go operating system was built to be a desktop for the masses--something you could load onto an old machine for grandma and grandpa to surf the web and send email. According to the guys who assembled the distro, the purpose of their creation is to be a "simple, user friendly, beautiful desktop for normal people". The review goes on to examine the OS in more detail. While he feels it has potential, it seems there are still some areas that need improvement. I downloaded a copy and installed it. I doesn't work with my wireless card, so it's hard for me to give an accurate assessment, because many of it's features depend on access to the internet. It also crash a few times, though it was able to recover without rebooting. All in all, I think it's still a bit raw, and needs more polish. I wonder how well it works pre-installed on Walmart's computer offering? I'm sure we will hear more as time goes on. He said the hardware was good, but he was not impressed with gOS software, saying it had too many rough edges; he replaced it with a standard Gnome Ubuntu desktop. Speedwise, it seemed to work just as well as gOS did. The gOS website, where you can download the OS as a live CD and try it out. Susan Linton tries out gOS and mostly likes what she sees. Some reason's why we might be seeing some very competitive prices in the PC market soon. Here is another Ubuntu based OS with a simple to use desktop, that looks very promising. Is Microsoft preparing to challenge Open Source? [...] What really worries me is what looks like an emerging pattern in Microsoft's behaviour. The EU agreement is perhaps the first fruit of this, but I predict it will not be the last. What is happening is that Microsoft is effectively being allowed to define the meaning of “open source” as it wishes, not as everyone else understands the term. For example, in the pledge quoted above, an open source project is “not commercially distributed by its participants” - and this is a distinction also made by Kroes and her FAQ. In this context, the recent approval of two Microsoft licences as officially “open source” is only going to make things worse. Although I felt this was the right decision – to have ad hoc rules just because it's Microsoft would damage the open source process - I also believe it's going to prove a problem. After all, it means that Microsoft can rightfully point to its OSI-approved licences as proof that open source and Microsoft no longer stand in opposition to each other. This alone is likely to perplex people who thought they understood what open source meant. Nor is this the only way in which Microsoft is carefully draining away the original power of openness. As many have pointed out, Microsoft's attempt to have its OOXML document format declared an ISO standard will devalue the whole point of having open standards. Moreover, the way in which Microsoft has gone about this – by encouraging friendly parties to join the ISO voting bodies – has damaged the open standards process well beyond this particular case. As Andy Updegrove points out, we are already seeing the knock-on consequences of this, as real open standards are stuck in a kind of administrative limbo thanks to Microsoft's corporate hacking of the ISO machinery. These deals with Linux companies agreeing to buy IP lawsuit protection may somehow later be used to try to establish some sort of precedent... I can't see exactly where it's all going; there are so many parties involved, and much depends on what others do or don't do, not just on what Microsoft does. But it is evident that Microsoft's increasingly active involvement with open source is also giving it power to shape it's growth and direction. It's a situation that needs to be closely watched. Food containers are also toilet or wash-basin shaped, and much of the food is made to look like human waste, reports China Photo Base. The owner claims the edgy nature of the restaurants is attracting younger diners. "Every detail tells you it's a bathroom, not a restaurant. 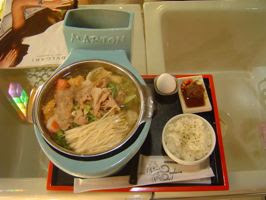 But it's fun to eat here," said one diner at a Taipei city outlet. 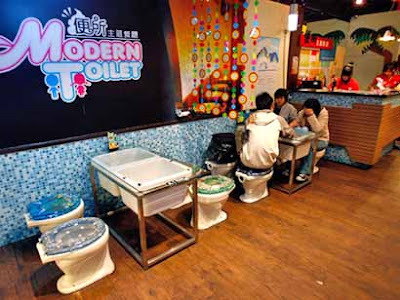 [...] The restaurants use ceramic toilet bowls/dishes to serve a range of meals. Apparently he was inspired by a comic book character who would put crap on crackers. No joke! This comic is popular with the young kids in Taiwan! The creator has now patented the idea and opened up several more branches around Taiwan. 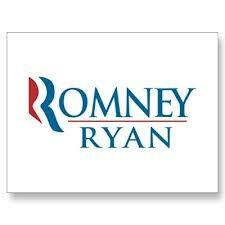 So if you ever thought the world was going down the toilet, now you have proof! The restaurants attract a range of customers but it is especially popular with young people and families with kids. Apparently it's not all just about novelty value and the restaurant gets many repeat guests. As a result it has introduced a loyalty program so you can collect credit on multiple visits and then receive a big toilet shaped bowl. These are also sold separately so you can take home a ceramic toilet bowl with you! Bleech! I guess I'm too old, or just no fun. Or maybe my idea of fun while dining out would just be something more... uh ... appetizing? The second article also has a link to a 3 minute video review in English (Australian?) about the restaurant chain, which seems quite successful. Walmart $200 Linux PC already sold out! They have sold out on-line; some may still be available in stores. They had 10,000 in stock. More are promised to be on the way. 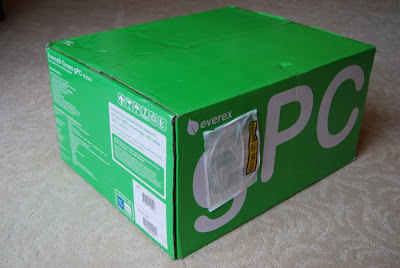 Right after Halloween, Wal-Mart introduced Everex's Ubuntu Linux-powered TC2502 gPC for a list price of $198. Two weeks later, they're sold out. Everex tells DesktopLinux that more will be coming though. Wal-Mart only bought an initial run of approximately 10,000 units. For once, Wal-Mart's vaunted supply chain management system failed to predict just how popular an item would be. 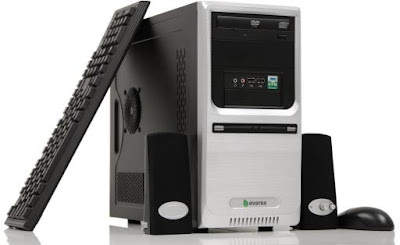 Wal-Mart offers a similar Everex model with more base memory and Windows Vista Home Basic called the Everex Impact GC3502 Desktop, for $100 more. Wal-Mart still has plenty of those. 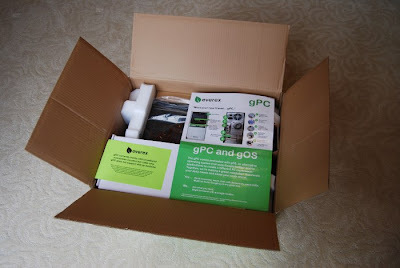 Customers want the Everex TC2502 Green gPC and they want it badly. While there are a few units still available in Wal-Mart stores, you'll need a lot of luck finding one. A search in your editor's area, Asheville, NC, found there wasn't a single one within a hundred miles. I also did an on-line search on Walmart's website, for stores in my area that still have some. There were none within a 100 mile radius. Not that I'm planning on buying one. I'll wait and see what happens to other people first. While this green PC is an excellent concept, I don't know much about the hardware involved. For years, I've been a sucker for all sorts of bargin PCs. Too often, I've found that they work fine for a year or two, then start having problems. For my past few PC purchases, I've stuck with HP, because I've found them to be a reliable brand, making computers that perform well for many years. Still, I watch this story with interest. Is it the begining of Linux being successfully marketed to the masses? It looks that way. Visit his blog for more photos of the unpacking. It looks like a nice easy-to-learn system at a great price. School textbooks: no more dead trees versions? Could Free-Reading offer a glimpse of the future, when big, bulky -- and expensive -- textbooks go the way of the film strip? Adam Newman of Eduventures, an education research and consulting firm in Boston, thinks so. "This is a shot across the bow for a lot of people," he says. Since March, Dixon Deutsch and his students have been quietly experimenting with a little Web site that could one day rock the foundation of how schools do business. He can visit the Web site and comment on what works and what doesn't. He can modify lessons to suit his students' needs and post the modifications online: Think of a cross between a first-grade reading workbook and Wikipedia Latest News about Wikipedia, the popular online encyclopedia written and edited by users. If Deutsch wants to see a lesson taught by someone who already has mastered it, he clicks on a YouTube Latest News about YouTube video linked to the site and sees a short demo. "I find it's more teacher-friendly than a textbook," he says. The article goes on to give some examples where this is being implemented, and what it could mean for the education industry. Would you buy a $50 eBook Reader? There has been a row going on between the "Little Green Footballs" blog and the "Brussels Journal" blog. In short, it seems the former has questioned the latter's affiliation with certain political groups in Europe, and now there are accusations of racism and Nazi affiliation being hurled about, regarding the latter's positions on Islamic immigration in Europe. I'm not going to jump into the fray, or summarize it here. It looks to me like a falling out between secular and religious conservatives, who agree on many things but also disagree on many others. Now that insults have been hurled, both sides seem to be overreacting, and in their defensiveness each is perhaps tending to oversimplify the views of the other side? I've often enjoyed Fjordman's articles at the Brussels Journal. He's often written about the abuse of political correctness and Multiculturalism in Europe, and how they are too often used by the political Left as weapons to stifle debate and silence opposition. Well, my answer to that would be: Americans have been bombarded with accusations of racism, almost exclusively against the European-derived majority, for decades. If I may be so bold as to say so, that’s what I really see when I look at the hysterical overreaction on part of Little Green Footballs regarding “white racism” in Europe, despite the fact that people of European descent are probably among the least racist people on the planet right now. There's more on his discussion with Charles, and there are lots of links embedded links too. I think it's fine that Charles at LGF asks questions about European political groups; Europe does have an actual Nazi history after all. But how about less political correctness, and more honest discussion about the FACTS? At any rate I'd like to see this row stop. 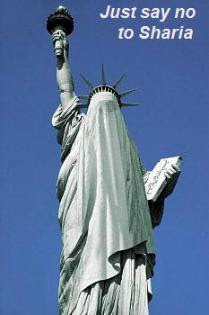 It's needlessly attracting the attention of groups like CAIR, who are using it to advance their own agendas. The Xandros Linux-powered "ultra-mobile PC" (UMPC) has finally arrived. One of the most eagerly awaited laptops in some time, the tiny Asus Eee PC 4G, is now available from online retailers that include Newegg and Directon. An ultra-low-cost Linux-based mini-laptop has received four stars and an Editor's Choice award in a recent Laptop Magazine review. 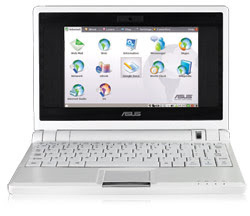 The Asus Eee PC (3EPC) 701 ultra-mobile PC (UMPC) was praised for its clutter-free desktop, fast start-up, and -- considering the price -- generous features. 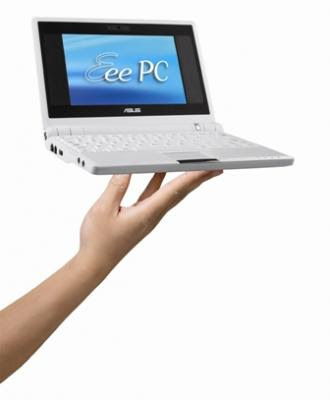 Earlier reports pegged the Eee PC's price at $190, and then at $250. However, the first shipping model in the 3EPC line barely squeezes in under $400. Still, reviewer Mark Spoonauer says the laptop compares well to other UMPCs, some of which cost even more. All things considered, I'm not as enthused about this product as I was when I first heard about it. It announced initially that the price would be around $200. Now the price is double that. Sure, they've added more flash memory, and that's driven the price up. But for a bit more than $400, you can buy a REAL laptop with a hard drive, full size screen and keyboard, and other standard features. I find the Eee interesting technically, and I will be watching the reviews to see how it does. But I doubt I will be buying one anytime soon. With any luck, the time may not be far off when I'll be able to buy an HP laptop with Ubuntu pre-installed. Here's to hoping! [...] "There has been a latent demand for a consumer-friendly Linux operating system, generating countless inquires from customers seeking an alternative PC experience," said John Lin, general manager of Everex. "The vision behind gPC was to provide mainstream users with all their favorite applications wrapped in a no-compromise, low-cost, consumer-friendly product. We're simply giving the people what they want. Everex enlisted the collective intelligence of users throughout the world. Customers love Google products, so we added them. Hackers want administrative privileges, so we provided it. The ultimate potential of a mainstream, open-source PC is tremendous." 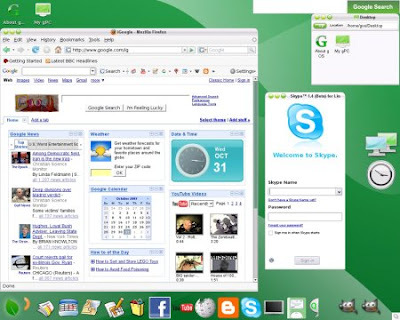 The operating system is based on Ubuntu, but uses a simpler window manager. See the rest of the article for more info and details. I know the Linux desktop isn't suddenly becoming popular or grabbing a lot of market share, but it IS making headway, and starting to become recognized as a viable choice for many people. More choice is what the desktop market needs, IMO. It's none too late, and most welcome.